Amsterdam, The Netherlands – Royal Philips Electronics (NYSE: PHG, AEX: PHIA) released its “Meaningful Innovation Index ” today, during its participation at the World Economic Forum in Davos, Switzerland. The Meaningful Innovation Index is a 5000-person, multi-country survey looking at people’s needs, attitudes and expectations regarding innovation. Based on responses from five key markets1, the survey shows that even with the recent advances in technology, there is huge appetite for innovations that will make a real difference in people’s everyday lives. 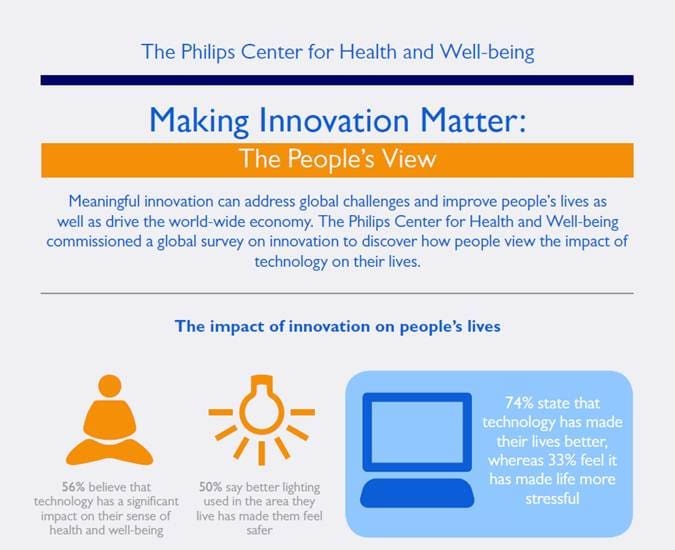 Philips’ Meaningful Innovation Index looked at satisfaction with current innovations with what is truly important in people’s lives and found that only 54% of people are satisfied with existing innovations in the areas they considered to be the most important to their lives. People’s preferences across age groups and various lifestages2 consistently point toward an ‘innovation gap’, indicating that there is room for companies to innovate in ten key areas of life: protecting the environment, saving money, stress relief, living independently as one ages, education, preventative health (preventing disease and illness), medical treatment, medical diagnosis, workplace efficiency and saving time. Almost three-in-five (58%) of people believe future innovations in medical technology will mean they will not be affected by serious illness. 64% of people expect to be able to manage their own health better through technology. Both young (18-24) and old (+65) generations consistently rank the same five areas of life as being most important to them: being happy, sleeping well, comfortable home to live in, a sense of safety in home environment, and communication with friends and family. 67% of seniors (65+) felt that technology had made their lives better, close to 74% of youth (18-24) who feel the same way. The importance of living independently does, as expected, increase as people get older but is a significant issue for all: 66% of seniors and 52% of youth are satisfied with products in this area. Across the markets, almost three quarters (72%) believe technology will improve energy efficiency in their homes. 64% of Chinese people feel that access to medical technology is important to living a long life, while only 27% of Russians agree. Citizens in markets like China, Russia and the Kingdom of Saudi Arabia (KSA) generally call for improvements on current technology, or for the ability for them to own more of the devices that already exist in the market. For example, 81% of Americans are happy with products available that help them to stay active, compared to just 60% of people living in China. To better serve these citizens, this may involve delivering technology that can be scalable, or simply producing more cost-efficient technology. “Innovation is the lifeblood of Philips and we are focused intently on improving the lives of people around the world by delivering meaningful innovations. By doing this, we will help countries improve their economic health and drive continual improvements in health and well-being of people on the planet,” concluded Jim Andrew. Starting today, 23 January 2013, Philips is actively contributing to the international debate at the Annual World Economic Forum, taking place in Davos, Switzerland. 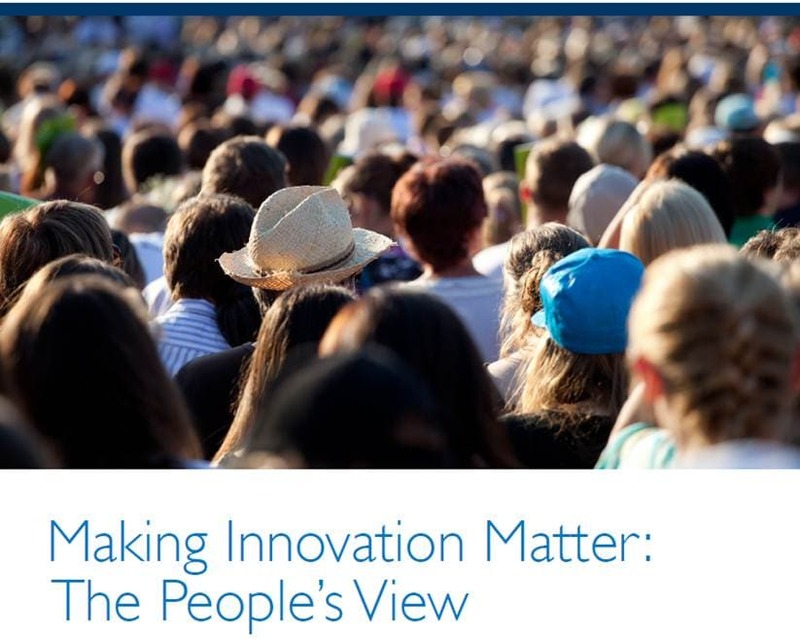 Throughout the forum Philips will make a positive case for stimulating meaningful innovation at two levels: to improve people’s individual lives as well as to drive economic and societal prosperity. ¹ The Philips Innovation Index, a nationally representative survey, was carried out in 5 countries: China, The Netherlands, U.S.A., the Kingdom of Saudi Arabia and Russia, surveying approximately 1,000 respondents per market. 2 Lifestage of people surveyed across the markets examined the types of life events they have experienced, their age, their family and their economic situations, and their experience with technology. Accordingly, eight groups of people were identified across the five markets, with each group representing a different lifestage segment: Traditional Families, Young Up-and-Coming Techies, Techie Family-Oriented Seniors, Steady Empty Nesters, Affluent Techie Families, Struggling Mature Tech-Intermediates, Middle-Aged Non-Traditional Families, and Starting Out Non-Techies. The Philips Meaningful Innovation Index is the latest in a series of Indices developed by The Philips Center for Health and Well-Being that will help us plan and develop appropriate solutions. A nationally representative survey was carried out in 5 countries: China, The Netherlands, U.S.A., the Kingdom of Saudi Arabia and Russia, surveying approximately 1,000 respondents per market. The survey looks at people’s affinity, experience, attitude towards technology – in other words, what does meaningful innovation mean to people.